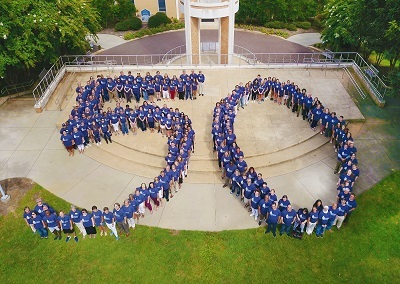 Put on your bellbottoms and tie dye and join Dalton State as it celebrates its first half century with food, fun, and fireworks Monday, Sept. 25 from 6-8 p.m. on the bell tower quad. There will be music celebrating the various decades of Dalton State’s lifespan as well as games and activities representative of the 60s, 70s, 80s, 90s and 2000s. Metz Culinary Management will provide food, including a five-tiered birthday cake. The evening will end with a fireworks display over the campus. All are invited; a special invitation is extended to all former students of the College as well as anyone who ever served on the College’s faculty or staff. Attendees are invited to bring lawn chairs and or quilts.